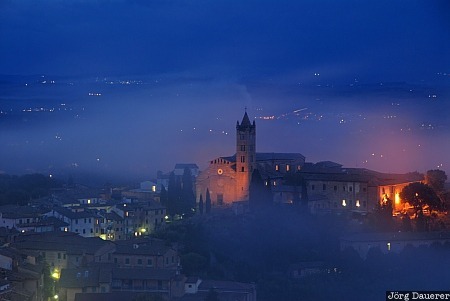 The Basilica of Santa Maria dei Servi in Siena surrounded by evening fog seen from the cathedral museum (Museo dell' Opera Metropolitana). Siena is in the central part of Tuscany, Italy. This photo was taken in the evening of a cloudy day in October of 2009. This photo is part of the exhibition Urban Fog (October 2018). This photo was taken with a digital camera.